A range of bespoke abrasive products for specialist applications. Vitrified and resin bonded rubbing blocks, oilstones and dressing stones in various grades of grit and hardness. 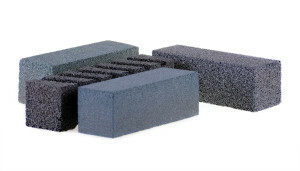 Rectangular coarse grit blocks for hand finishing of concrete floors and mouldings. These blocks are also used to shape stone and marble. The porosity and hardness are determined by the combination of grit and binders. The characteristics of the block are therefore adaptable for specific applications. When finishing concrete a fluted shape block can be used where extra swarf shedding is required. Our oilstones use a special bond which means that water can be used as an alternative to oil when sharpening high quality steel tools. The oilstone surface continually breaks down to a form an abrasive slurry which when worked with a tool produces an exceptionally keen edge. Our oilstones can be made from either a single grit grade or a combination of grit grades where each half of the stone is made from a different grade. Dressing stones are designed to clean the working surface of an abrasive wheel and therefore to maintain its performance. White aluminium oxide dressing stones of various grades can be used to dress diamond wheels. For the dressing of vitrified bonded wheels we can provide coarse silicon carbide dressing stones.